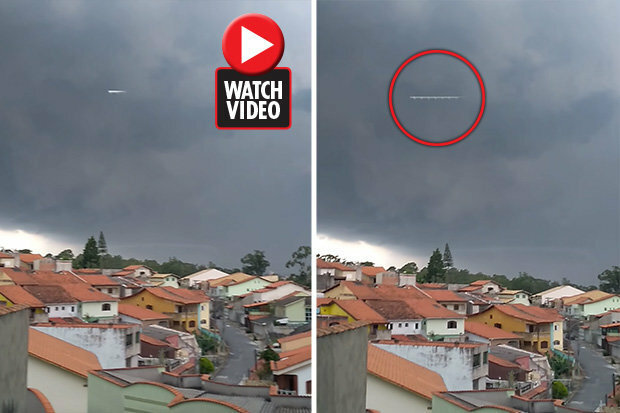 Bizarre footage has emerged that shows a mysterious light darting across the skies, sparking fears that governments around the world are testing weather modification. The strange event is said to have occurred when a man was recording a thunderstorm. It shows a long white line ripping through the skies towards the ground, before changing direction. It then disappears completely behind the clouds before reappearing once more. The unexplainable event occurred in Pargue Do Carmo, Brazil, on February 11, but has only come to light after being shared on Friday. The clip was uploaded to popular YouTube conspiracy channel UFOmania and it has already racked up 23,500 hits. Viewers were quick to speculate what it could be. One comment read: "Possibly some sort of exhaust fumes from a UFO?" Another even claimed "that's the DeLorean hitting 88mph," in a reference to the film Back to the Future. But others believed it could be more sinister still. "Experiments in the skies," a viewer stated. Before someone else pointed out: "Looks like cloud dispensing." Climate engineering, commonly referred to as geoengineering, is the deliberate and large-scale intervention in the Earth’s climate system with the aim of bringing about adverse global warming. But some conspiracists believe governments around the world are preparing to weaponize these strategies. Only last week, we saw similar scenes when an "eye in the sky" appeared in the Netherlands. And before that, a mysterious black trail in Hawaii sparked concerns of a HAARP rocket.